There’s so much color in the depths of South Florida, but this little one’s not native to the area. It’s native to a region where I was raised (roundabout, anyways). 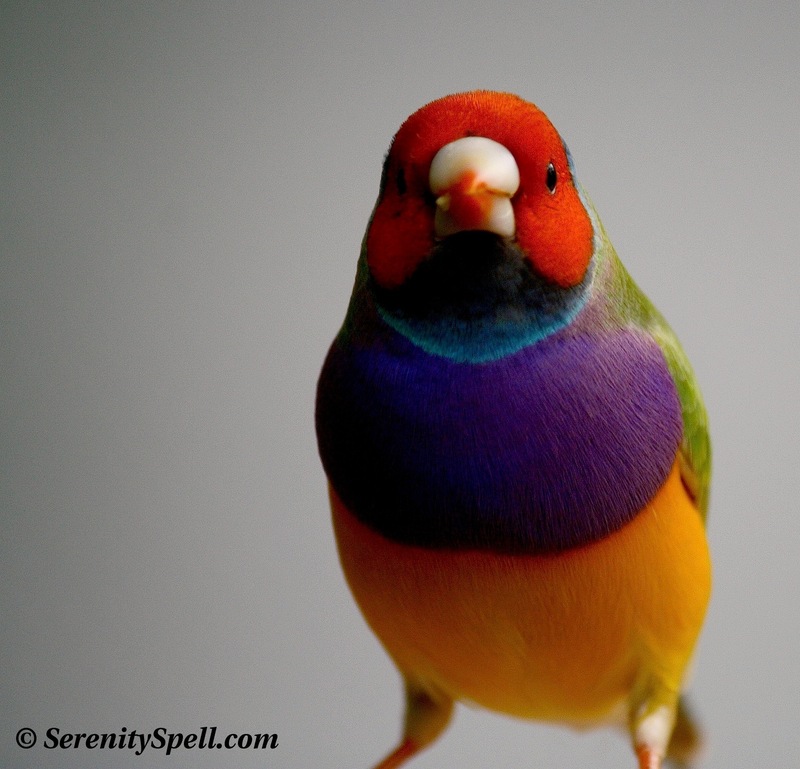 When I think of COLOR, my brain always returns to the petite endangered Gouldian Finch — also known as the Rainbow Finch, appropriately. This spectacularly-colored little bird is native to Australia, where their numbers have decreased dramatically throughout the 20th century due to habitat loss. They remain an endangered species in their natural habitat, with less than 2,500 remaining. While attempts at their reintroduction have proved unsuccessful, thankfully these lovely finches are the subject of a conservation program in Australia. There are currently plans to recover and conserve their natural habitats, with management guidelines in place to educate landholders about land management, promoting the recovery program, and Gouldian Finch conservation. They’re also popular birds in captivity and among breeders, which keeps their general populations higher. In 1992, the species was classified as endangered in the wild. That same year, Catwoman stuffed a poor Gouldian into her mouth in Batman Returns — some say, to raise awareness for their plight. Here’s to wishing all the best for this beautiful and bright little bird! With Florida’s abundant all-year blooms, flurried butterfly activity is a welcome sight on hikes. 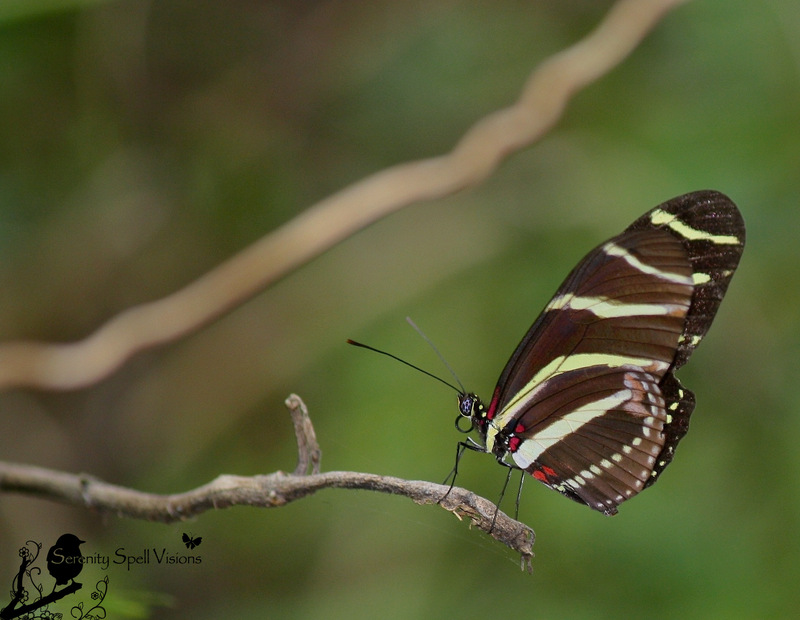 The most common encounter is the Zebra Longwing (Heliconius charitonius), designated as the official state butterfly of Florida in 1996. No wonder it’s the state butterfly; it’s found throughout Florida in hardwood hammocks, swamps, wetlands, meadows, and in the Everglades. And if you’re keen to plant native, butterfly-friendly plants in your garden, you’ll quickly be visited by these lovelies. While Longwings can be seen throughout Florida, they’re most abundant in the southern half of the state. Despite its common presence, it’s always a wonderful sight — bright and bold in our swamps and marshes. 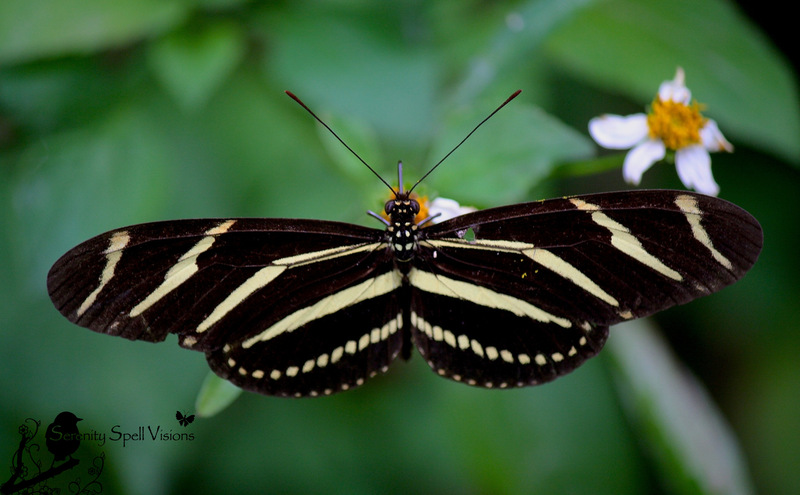 As the name suggests, Zebra Longwings sport long, narrow wings, with light yellow and black stripes. Adults can mate immediately upon emerging from the chrysalis — I once witnessed a few Zebra Longwings crowding a poor lone Longwing, and feared they were attacking him/her. I now understand what was happening — the female was emerging from her chrysalis, as the males had been attracted to her scent through the chrysalis wall. They battle their way to mate with her, as she emerges. Hello, world?! Another unusual sight I’ve witnessed (but haven’t been able to capture well) is their roosting behavior — Longwings will group together as dusk approaches, to keep warm through the night. They return to the same roost night after night…. 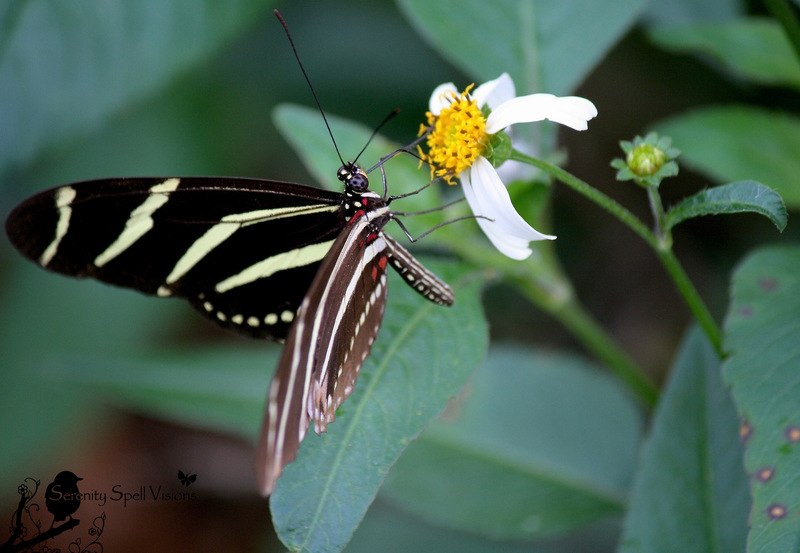 A tropical and subtropical species, the Zebra Longwing is unlike other butterfly species that live for only a few weeks: these guys can live for up to six months (6 months! ), since they eat the pollen AND the nectar from flowers. 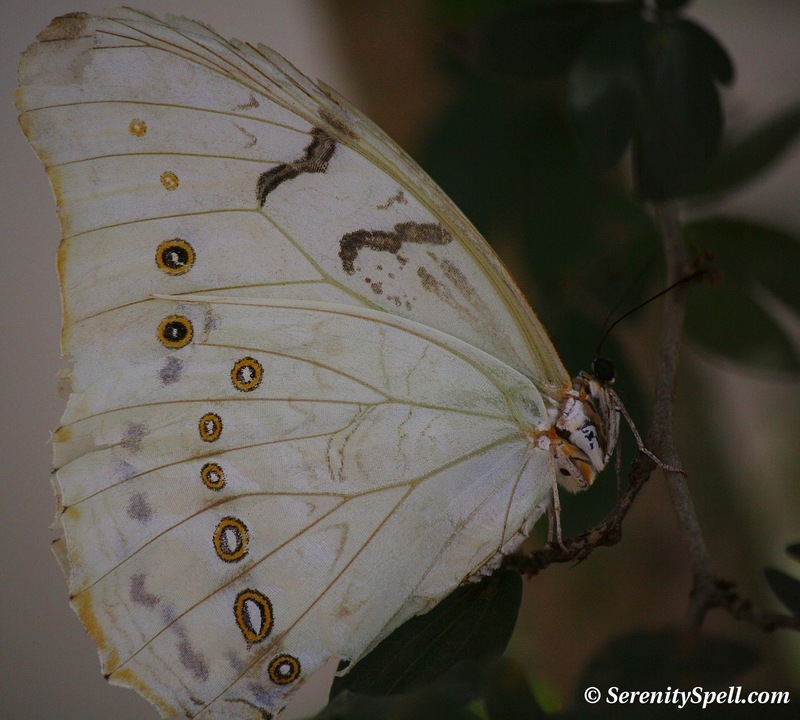 They are the only butterfly to do this, and the energy from the pollen extends their lives. 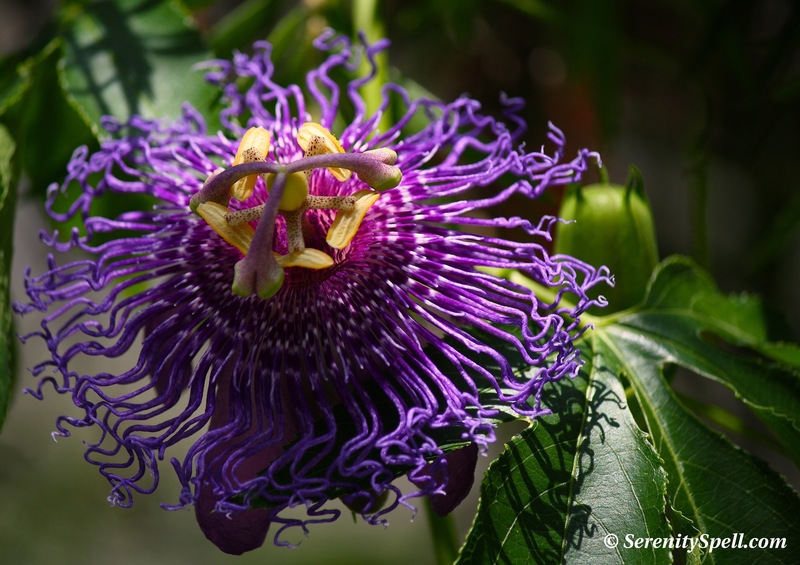 The caterpillar feeds on various varieties of the Passion Flower (Passiflora), which is another great reason to have this beautiful vine in the yard, if you live in the Southern parts of the U.S. (and South and Central America). They’re easy to grow, and oh-so-lovely — and their widespread health benefits have been respected for centuries. 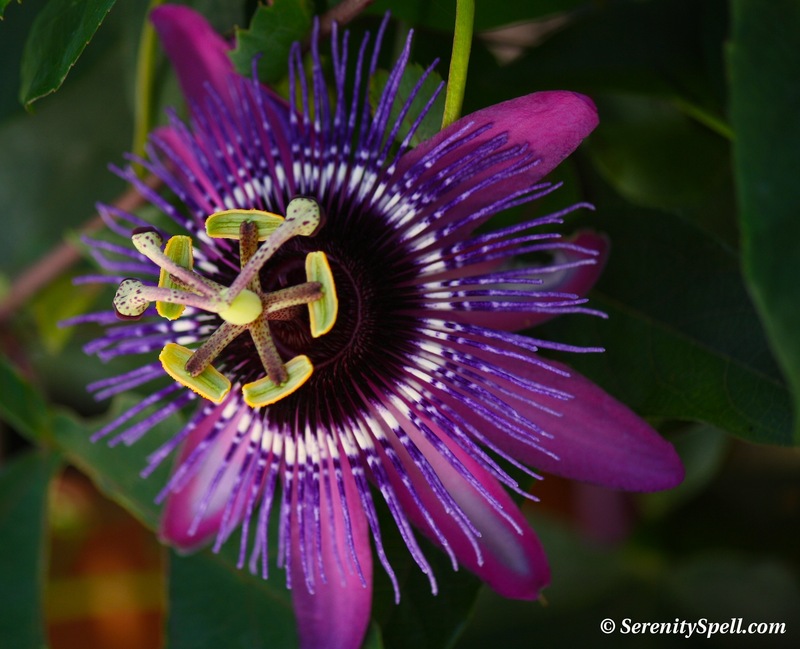 Outside of passiflora tea, it’s been used for more than two centuries by Native Americans as a sedative and relaxant — and traditional medical practitioners accept its help in alleviating pain and lowering blood pressure, among other things. Even WebMD acknowledges its use for seizures, withdrawal symptoms, asthma, fibromyalgia, burns, swelling, muscle spasms, and more. 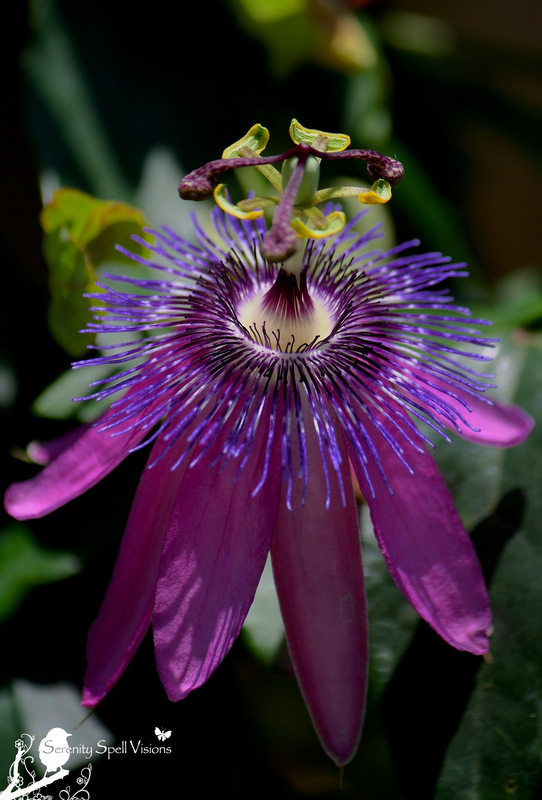 Passiflora was approved as an over-the-counter sedative and sleep aid in the U.S., only to be taken off the market in the ’70s, like so many other natural remedies. Yet another example of the many gentle and beautiful ways in which Nature provides! 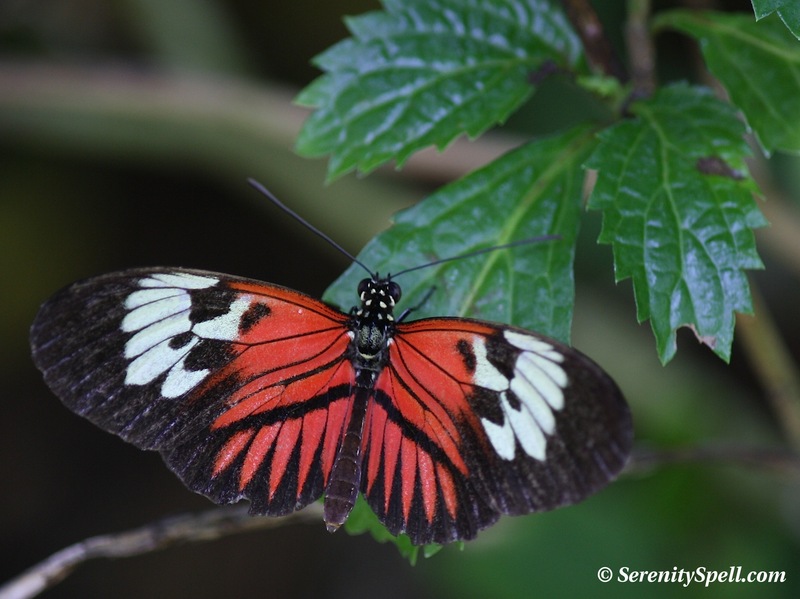 For more information on introducing butterfly-friendly plants to the garden, visit Butterfly World and its wealth of information. Butterfly World’s conservation efforts include the establishment of The Passiflora Society International, which was established at the site to encourage research on Passion Flowers, the source of food for many butterflies. A North American “Bring Back the Butterflies” campaign is also active here, with thousands of people across the country receiving free literature on butterfly gardening for their region. Check it out! 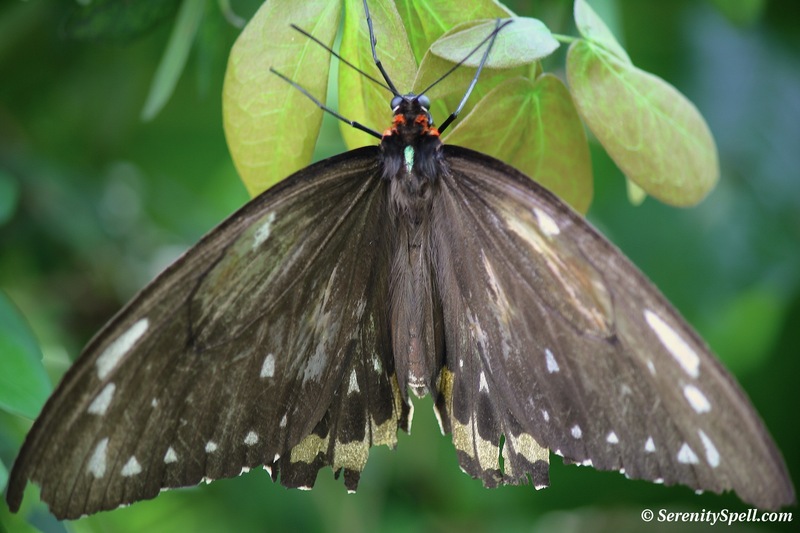 Butterfly World also helped establish the Boender Endangered Species Laboratory at the University of Florida — instrumental in saving the endangered Schaus Swallowtail, and reintroducing the species to South Florida. I captured this brave beauty at Butterfly World’s Jewels of the Sky Aviary, the largest free-flight hummingbird aviary in the United States. It’s a most amazing, beautiful, and fairy-like place — a huge and lush flower-filled habitat of Hummingbirds, Honeycreepers, and Euphonias. An increase in backyard gardens hummingbird feeders allows these birds to refuel during their long migratory journeys — YAY! 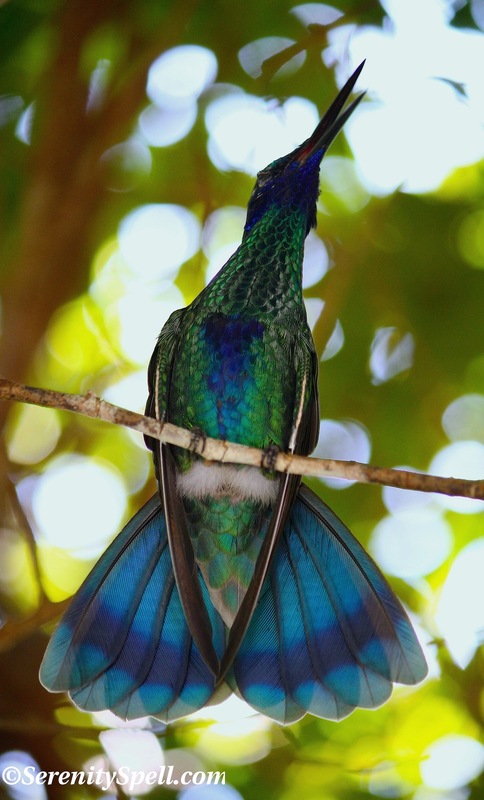 Sparkling violet ear hummingbird: Just adore me. 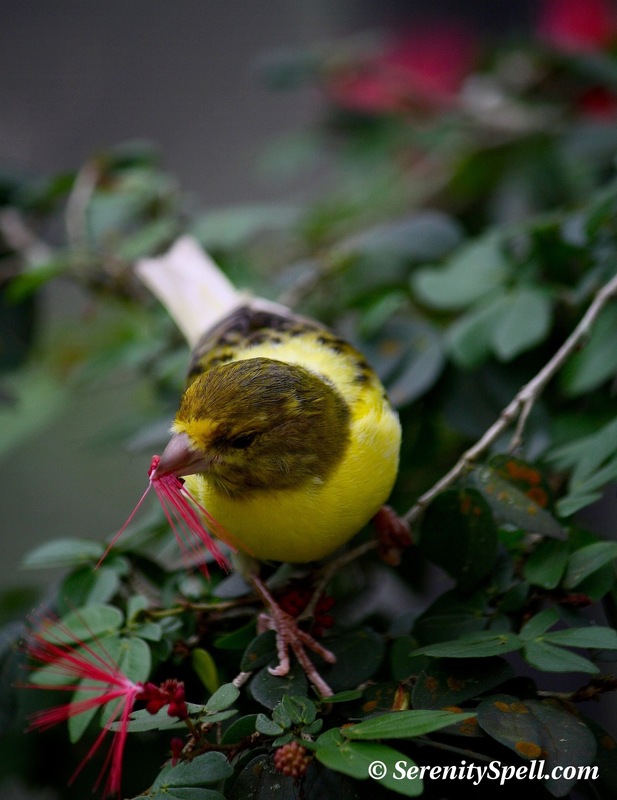 The Wild canary (Serinus Canaria) — Canary, Common Canary, or Atlantic Canary — is native to the Canary Islands, the Azores, and Madeira. 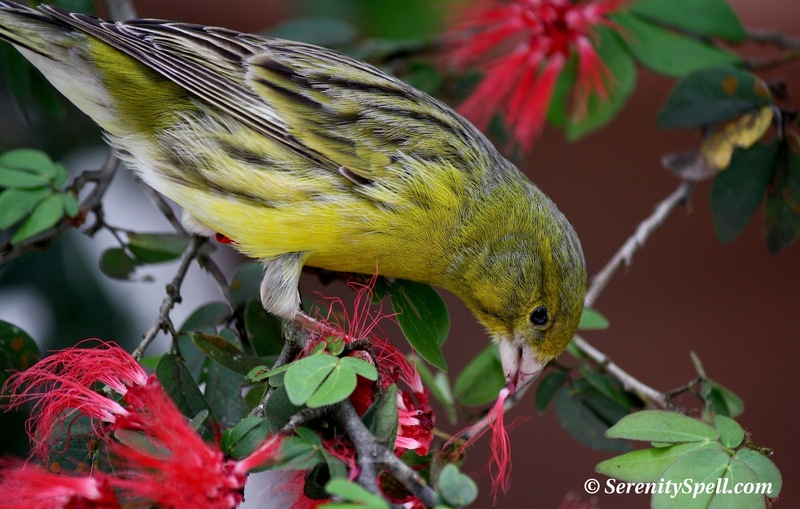 These wild birds are mostly yellow-green, with brownish streaking on the back — similar to a sparrow in size and markings. It belongs to the finch family. The bird is named after the Canary Islands, derived from the Latin Canariae Insulae, meaning “Islands of Dogs.” They were so named by the Romans, in honor of the islands’ native inhabitants breeding large dogs. 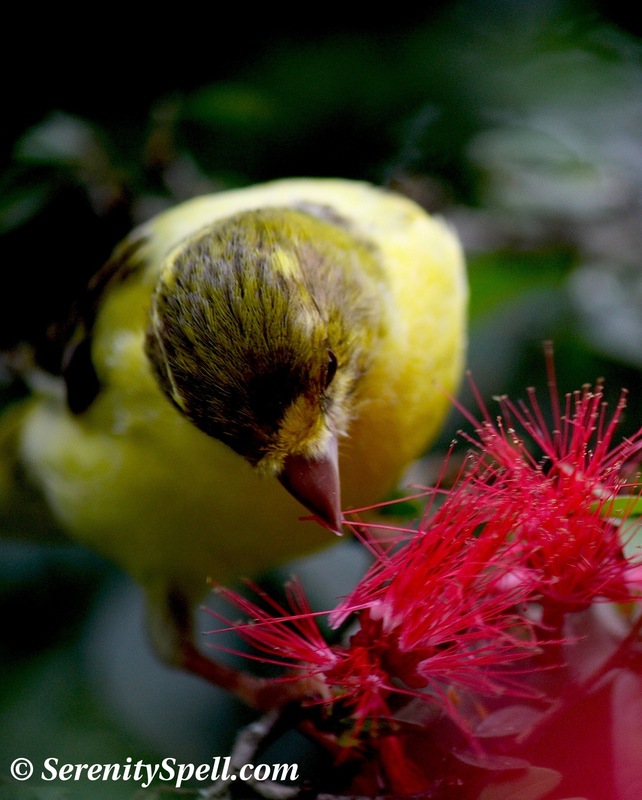 So the word “Canary,” derived from the Latin Canis, means “dog.” The Spanish conquered the islands in the late 1400s, and returned to Europe with the yellow songbirds. From there, Italy, Germany, France, Belgium, and later the U.S. bred their own versions of these colorful little birds, primarily for their sweet song. 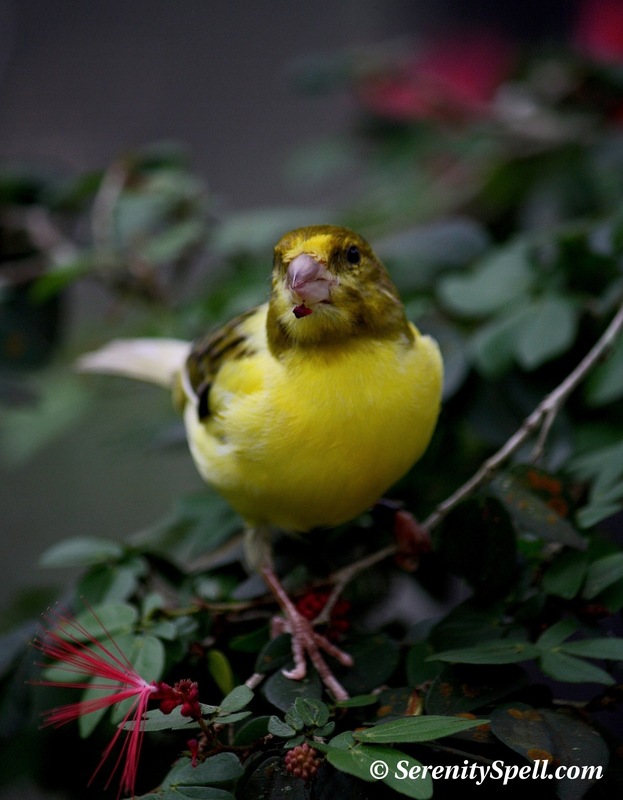 Germany became the center for breeding canaries, and for training them to sing. They were so widely bred, that by the beginning of the 18th century, 29 distinct varieties were already in existence. Today, the species is common in captivity, with myriad color variations — and breeders striving for more color, song, and physical diversity. 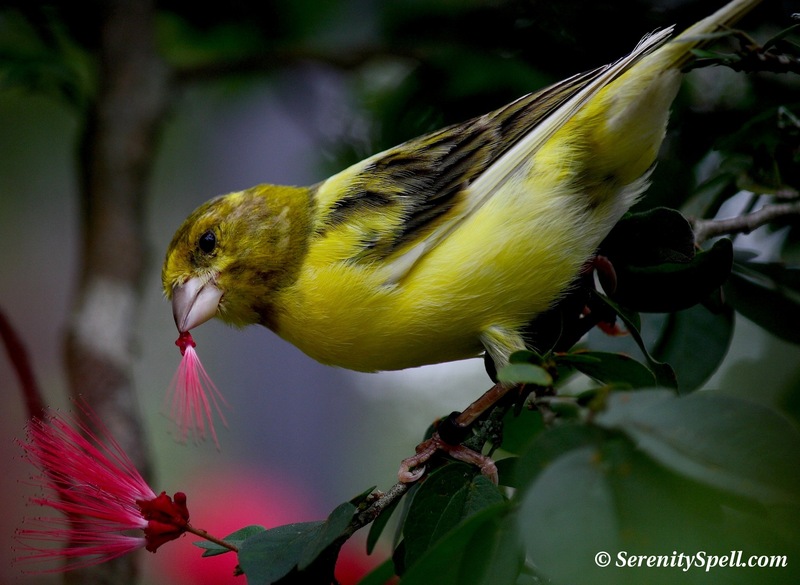 But taking a peek at the original Wild canary, it’s difficult to find similarities to the bright yellow counterparts you may encounter today. Personally, I find them that much lovelier. During mining’s heyday, canaries were taken deep into coal mines to detect gases; being sensitive, they would soon die if gases were present. On that note, I give you The Police’s Canary in a Coal-Mine, a great ditty that’s been in my head for days, understandably…. 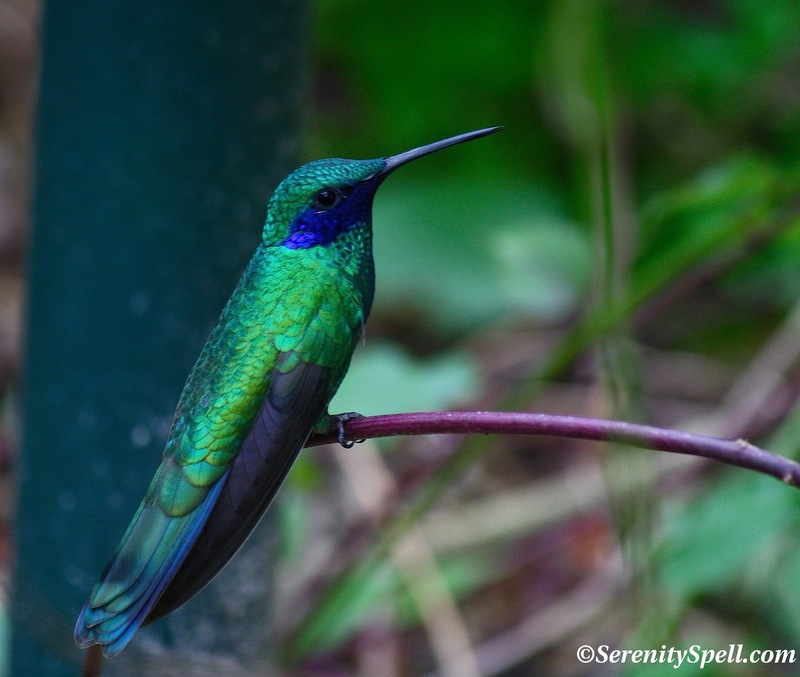 This golden beauty was twittering about the lush and fairy-like Butterfly World’s Jewels of the Sky Aviary, the largest free-flight hummingbird aviary in the United States. He finally settling on a Red Powderpuff plant (Calliandra haematocephala). 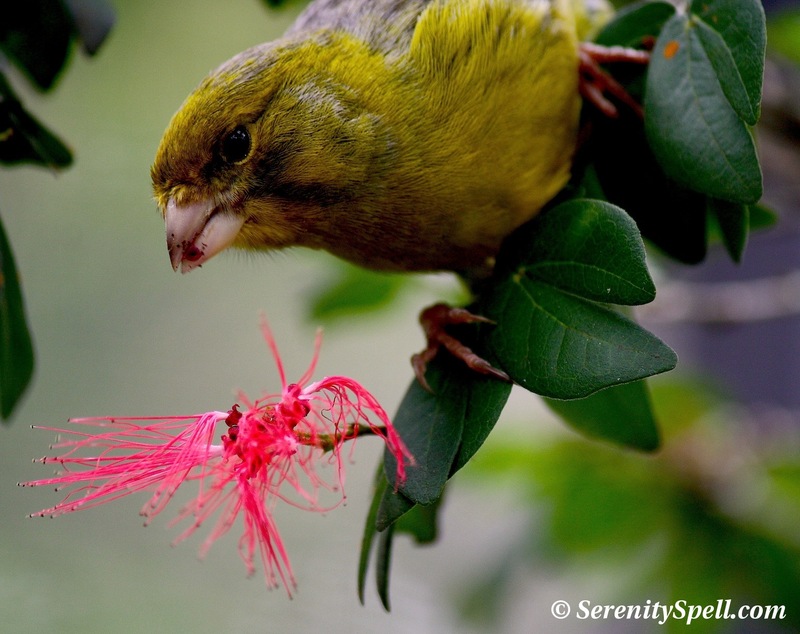 Red Powderpuffs are subtropical shrubs/trees that are easy to grow (and not just in Florida, but they do grow LARGE here), and even better… They’re attractive to bees and butterflies — and obviously birds! May your weekend be as golden and bright as this lovely little songbird! I captured this brave little fellow at Butterfly World’s Jewels of the Sky Aviary, the largest free-flight hummingbird aviary in the United States. It’s a most amazing, beautiful, and fairy-like place — a huge and lush flower-filled habitat of Hummingbirds, Honeycreepers, and Euphonias. 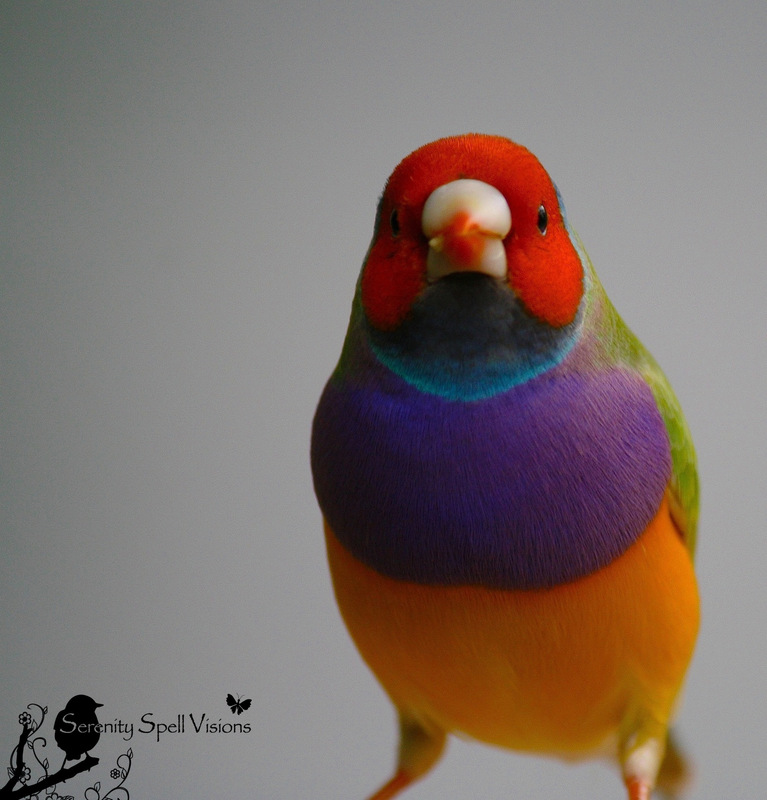 The Gouldian Finch (Erythrura gouldiae), also known as the Lady Gouldian Finch, Gould’s Finch, or the Rainbow Finch, was named for Elizabeth Gould, wife of British ornithological artist John Gould. This spectacularly-colored little bird is native to Australia, where their numbers have decreased dramatically throughout the 20th century due to habitat loss. They remain an endangered species in their natural habitat, with less than 2,500 remaining. In 1992, the species was classified as endangered in the wild. That same year, Catwoman stuffed a poor Gouldian into her mouth in Batman Returns— some say, to raise awareness for their plight. However, they’re popular birds in captivity and among breeders, which keeps their general populations higher. The delicate Gouldian Finches are difficult to breed outside of their native Australia — they demand a clean environment and excellent nutrition to survive and thrive, and aren’t suggested for novice breeders. (I personally have issues with caged birds, but wanted to include this tidbit.) While attempts at their reintroduction have proved unsuccessful, thankfully these lovely finches are the subject of a conservation program in Australia. There are currently plans to recover and conserve their natural habitats, with management guidelines discussed to educate landholders about land management, promoting the recovery program, and Gouldian Finch conservation. Gouldian Finches gather in flocks in the wild, most likely to protect against predation. They’re highly sociable birds, but more often with other birds than with humans. Both sexes are brightly colored, with black, green, yellow, and red markings — but with selective breeding, there are now many color mutations. As usual, females tend to be less brightly colored (the males do the strutting). Gouldians bond and mate for life. In honor of this beautiful, endangered, and brave little finch, may you have an equally bright weekend! Butterfly World’s conservation efforts include the establishment of The Passiflora Society International, which was established at the site to encourage research on passion flowers, the source of food for many butterflies. Luckily, they grow easily in our area. And I’ll be replanting one soon — my last climbing passion flower vine never took, curiously. I’d like to blame it on bad energy at the time (not bad placement or other planting faults) and try, try again to attract more butterflies to my little garden. 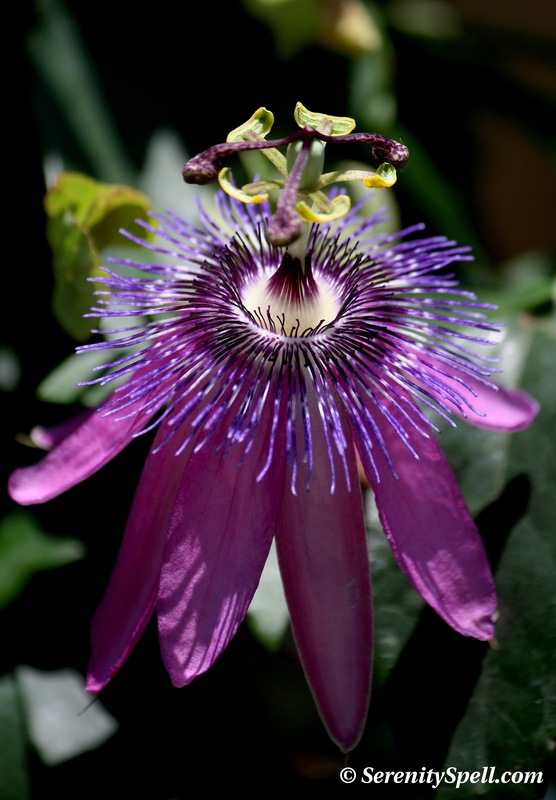 I knew passiflora tea was good for you, but I just learned HOW good — there are numerous health benefits associated with the plant. It’s been used for more than two centuries by Native Americans as a sedative and relaxant, and traditional medicine practitioners widely acknowledge its help in alleviating pain and lowering blood pressure, among other things — per WebMD even, it can be used for seizures, withdrawal symptoms, asthma, fibromyalgia, burns, swelling, muscle spasms, and more…. It was even approved as an over-the-counter sedative and sleep aid in the U.S., only taken off the market in the ’70s when its effectiveness hadn’t been proven… Just like so many herbal remedies. I think I’ll be buying some passiflora tea. Yet another example of the many gentle and beautiful ways in which Nature provides. In light of recent events, smiles were in order… So we hiked, we walked our natural areas, and we visited the butterflies!! I’m a nut for butterflies — I often find myself plowing through beastly banana spider webs, or managing the swamp, to chase butterflies on our hikes. More than once I’ve nearly tripped over large, scaly, and silent objects at the water’s edge — quite unlike a butterfly — in my efforts to photograph these lovelies…. Butterfly World, located here in South Florida, opened in 1988. 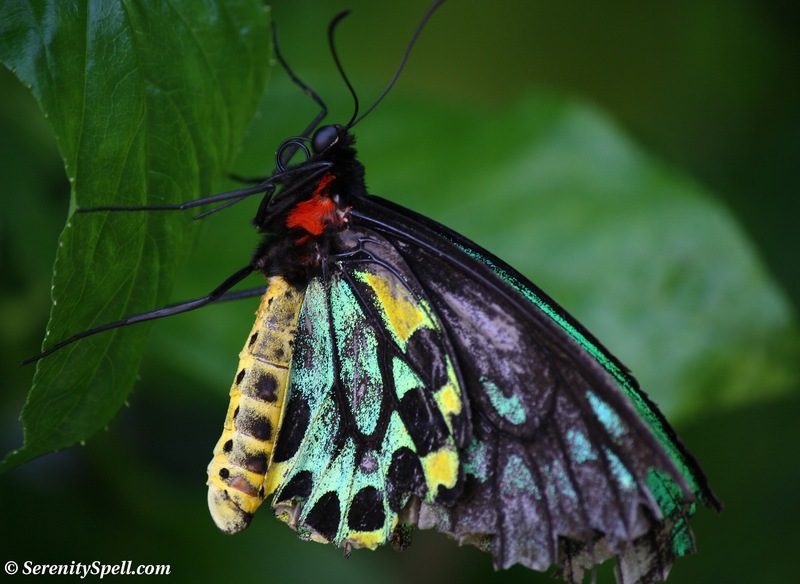 It’s the largest butterfly park in the world, and the first of its kind in the Western Hemisphere. At any given time, more than 3000 live butterflies are fluttering at the facility (and usually MORE), representing 50 different species (150 species over the course of an entire year). This is all thanks to Robert Boender, who raised butterflies and their food plants from his Florida home, post-retirement. In 1984, he was supplying farmed butterflies to zoos and universities with his own company. He met Clive Farrell — founder and owner of the London Butterfly House — in 1985, during a visit to England. 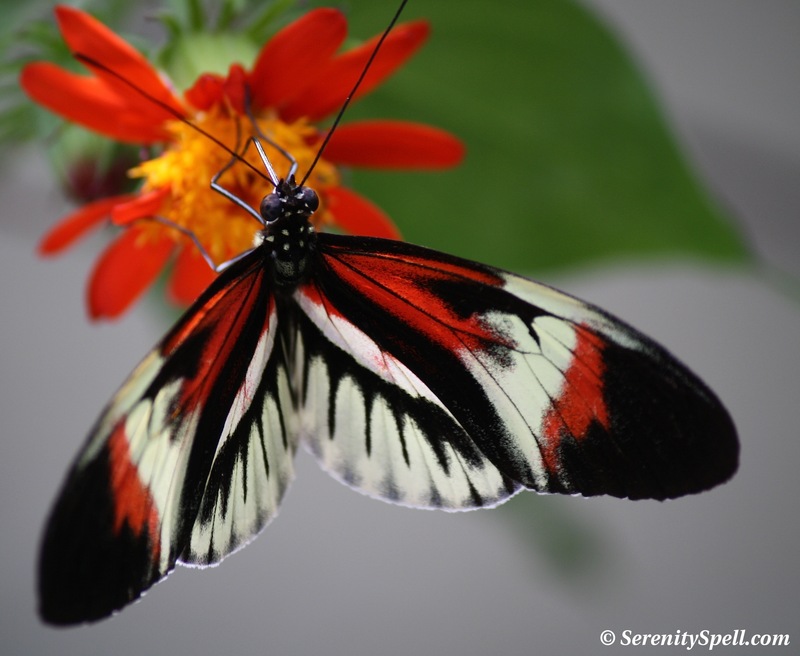 Wanting to create a similar facility in Florida, Boender and Ferrell joined forces and began plans to create a combination public attraction / research facility and butterfly farm — and Butterfly World was born. Visitors enter the spectacular Paradise Adventure Aviary, with fountains, ponds, lush vegetation, and of course thousands of butterflies — representing five continents. It’s a glorious shock to the human system, to be suddenly surrounded by thousands of fluttering brilliant colors. The Hanging Garden & Butterfly Emerging Area is next, where cases filled with pupa and emerging butterflies are displayed. Finally, the Tropical Rain Forest Aviary recreates a rain forest — complete with waterfall, thousands of tropical plants, and free-flying birds and butterflies. Butterfly World also includes the largest free-flight hummingbird aviary in the United States — the Jewels of the Sky Aviary — as well as a Lorikeet Encounter, and an aviculture research center. At the butterfly laboratory, visitors can view — through a glass enclosure — where butterflies are raised, observing the different stages of formation including eggs, caterpillar, and pupa. At the Museum/Insectarium, exhibits of mounted specimens of beetles, butterflies, moths, and other insects are displayed. The Bug Zoo features live insects, including spiders, walking sticks, and mantids. Not particularly my favorite part of the facility, having been raised on the Equator, on a tropical island where insects grew to gargantuan proportions — and there was little barrier between you and them. Other features include Grace Gardens, offering examples of the world’s flowering tropical plants. The Wings of the World Secret Garden presents one of the largest collections of flowering Passion Flower vines (passiflora) in the world — beautiful beyond compare. Butterfly World’s conservation efforts include the establishment of The Passiflora Society International, which was established at the site to encourage research on passion flowers, the source of food for many butterflies. A North American “Bring Back the Butterflies” campaign is also active here, with thousands of people across the country receiving free literature on butterfly gardening for their region. Check it out! 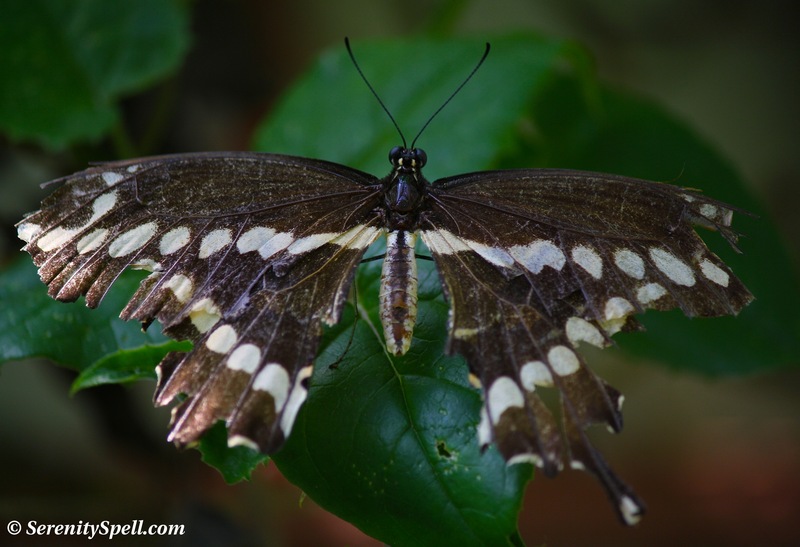 Butterfly World also helped establish the Boender Endangered Species Laboratory at the University of Florida — instrumental in saving the endangered Schaus Swallowtail, and reintroducing the species to South Florida. Many pesticides kill butterflies (and bees, and…), so it’s important to be safe with their use — or, use ladybugs in their stead! Sadly, butterflies came up in the news recently with companies like genetically-modified foods giant Monsanto. Monsanto’s Roundup Ready Crops have been tied to the decrease in Monarch populations by killing the very plants that the butterflies rely on for habitat and food — milkweed. These plants are being destroyed by the heavy use of glyphosate-based pesticides on Roundup Ready crops. Over the past 17 years, the Monarch butterfly population in Central Mexico has declined, reaching an all-time low in 2009-2010. Obviously there’s a far bigger picture here, which many are aware — land destruction, farmers’ livelihoods, and our own health — but when the news was released that these companies and their crops were now ravaging the butterfly populations (for years, now)…. Honestly. But thanks to the education and conservation campaigns of facilities like Butterfly World, perhaps there may be some sort of balance reached between the destruction caused by these companies, and a return to the natural order. …And on to the birds!